Can you imagine walking in the footsteps of Anne Boleyn and Henry VIII, visiting the castle they stayed in when they were still in love (no chopped off heads at this point)? Well, if you go to the Thornbury Castle Hotel, in South West England, you can do exactly that. It’s magical to travel back in time, while you can actually stay in the room the royals slept in on their honeymoon tour. This extraordinary Tudor Castle hotel stands on the edge of the charming town of Thornbury, not far from Bristol (around two hours or so from London). It reeks with history, has stunning views, huge chimneys, and beautiful grounds – the oldest Tudor gardens in England (where, when the weather’s nice you can enjoy a typically English cream tea). It also boasts roaring fires, four poster beds, a suit of armour and even its own impressively crested toilet tissue. Work on building the castle began back in 1511 and it was intended to be a home for the Duke of Buckingham. Ten years later, when the building was almost finished, Buckingham (a distant cousin of the king) was accused of treason by Henry. He was beheaded and his castle confiscated. Fourteen years later, the King took his new bride, Anne, to stay at Thornbury for ten days. Mary Tudor (“Bloody Mary”) also stayed here as a princess, but after her death, the Castle went back to Buckingham’s descendants. It became a hotel far more recently, back in the 1960s and has recently been renovated and refurbished. It is not the kind of place you stay at and then forget, being quirky and atmospheric. Its 26 bedchambers are all different from each other. The Duke’s bedchamber is the room which Henry and Anne slept in (you won’t be surprised to hear that you need to book early for this!) while the Tower Suite – reached by a spiral staircase of 77 steps – contains a 10ft wide bed, the largest in any British hotel. We stayed in the Portlethen suite which you also reach by going up a stone staircase and which is not in the main building, but the gate house (which was fine with us). We loved it as it was just so redolent of times gone by, with its own old tapestry hanging on the walls and an incredibly comfortable four poster bed for us (the children slept in the living area on pull out beds). The bathroom was well-stocked with lovely toiletries, but it was old-fashioned (and that’s a good thing in our book). The main building contains the coat of armour, dining room and library. One of the best bits of information we gleaned was that the long windows in the dining room had a very definite purpose. They existed so that men wouldn’t have to leave the room when discussions (and plotting) were going on. In other words, they were kind of mini public restrooms! We loved our stay at Thornbury, but of course it wasn’t absolutely perfect (is anything?). We have no complaints about the marvellous rooms, and we also loved climbing the stone staircase, but realise that this would be tricky for those with small children, and also for those who have problems getting around easily. Our only issue was that, although the staff were all friendly, the service was slow and, in order for our stay to have been out of this world, the food could, and perhaps should, have been better. As it was, however, it was still pretty damn special. 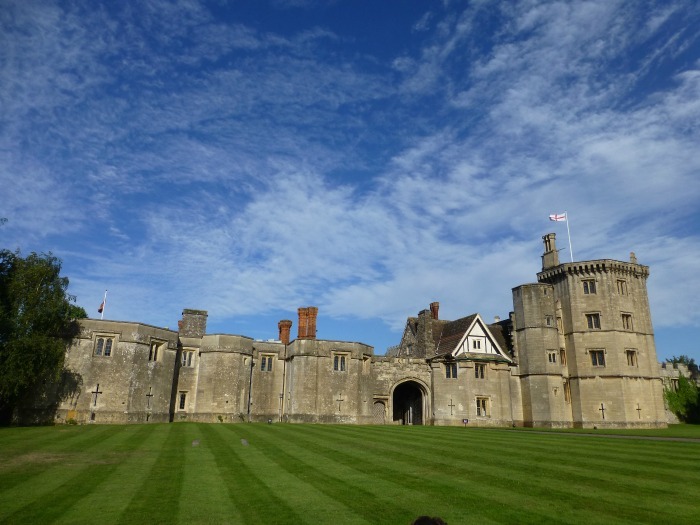 We stayed one night as guests at Thornbury Castle, near Bristol, which is part of the Luxury Family Hotels collection. However, all our opinions are our own. Sarah Ebner runs Family Travel Times, a blog all about vacations and days out, in the UK and way beyond. It's a proper family affair, as she and her two children, Jess, aged 12 and Robert, aged 9, write their own posts. Their dad Brian occasionally contributes too! Sarah is an award-winning journalist who writes for The Times newspaper in London. Wow–what a unique and incredible place to stay! I know I’d jump at the chance to spend time in a castle–especially one with such an interesting history like this one! Sign me up! I have yet to stay in castle, but by golly it’s on my list. Sounds like a great night for something a little different! I’d love to be able to sleep in a castle for a night.